Sullivans Gold Petite Embroidery scissors with shiny gold, ergonomic teardrop handles. 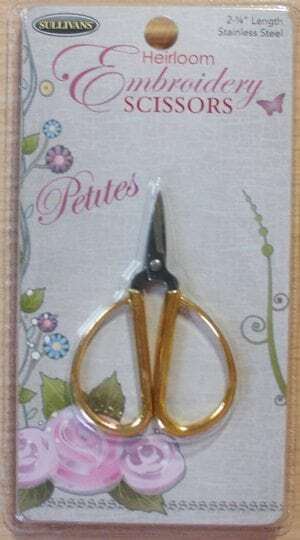 These lovely Petite Embroidery Scissors are ideal for delicate cutting and trimming. High quality, stainless steel blades. Large, ergonomic teardrop handles make cutting and crafting comfortable for anyone. Sharp points for delicate cutting and trimming. Perfect for Cross Stitch, Embroidery, Needlepoint, Sewing, Quilting and all types of Stitchery projects.